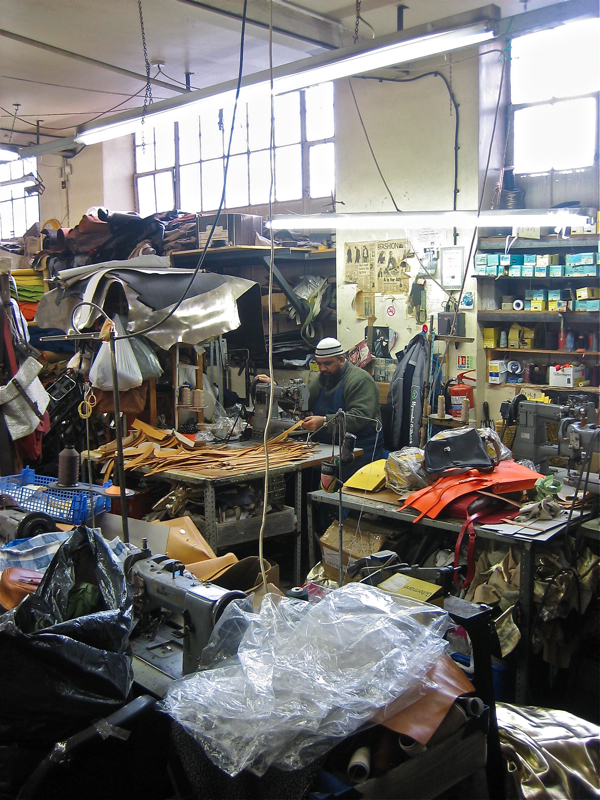 Ally Capellino took me to visit J&R Designs in Homerton yesterday, the small East End factory run by the Persaud family where many of her leather handbags are manufactured. 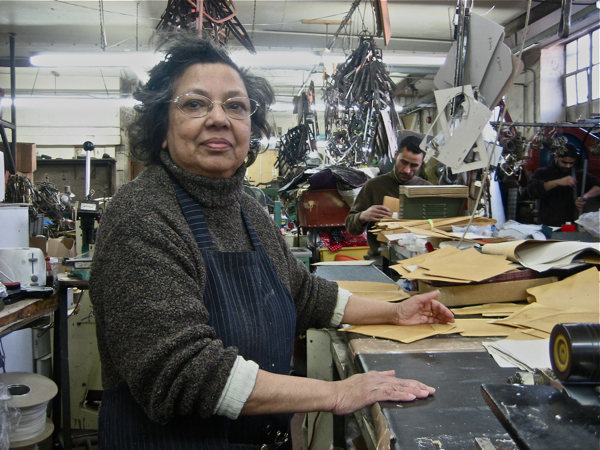 Ten years ago, Ally brought some of her first designs for handbags here to be made and over the years a lively partnership has developed that permits her to create distinctive designs taking advantage of the unique possibilities offered by the experience and talent of those who work here – in direct contrast to the standardisation that is occurring in the mass production of bags by overseas manufacturers. 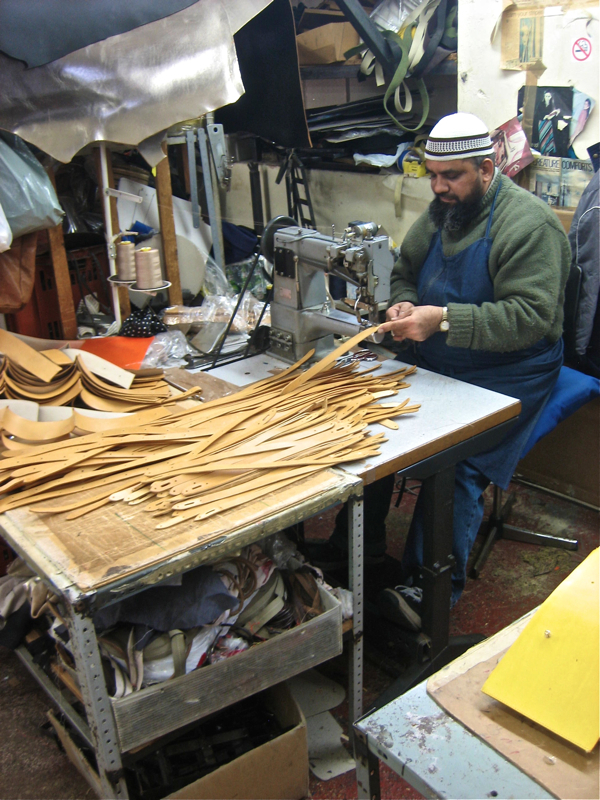 Until fifteen years ago, J&R designs mass-produced bags for large British High St retailers like C & A, Dolcis, Lilley & Skinner, and Stead & Simpson. But as these closed down and competition from the Far East eclipsed the cost of production in this country, most of the bag manufacturing companies in the East End – that once lined the entire stretch of the Hackney Rd – shut forever. Yet the Persauds managed to adapt, and today they thrive by working with small labels and new designers to produce limited quantities of bags to a high standard of finish in fine leather, by contrast to the thousands of PVC bags they once churned out to order. From the outside, their factory looks derelict, but once you enter through the rusty steel doors, you find yourself in a busy workshop. 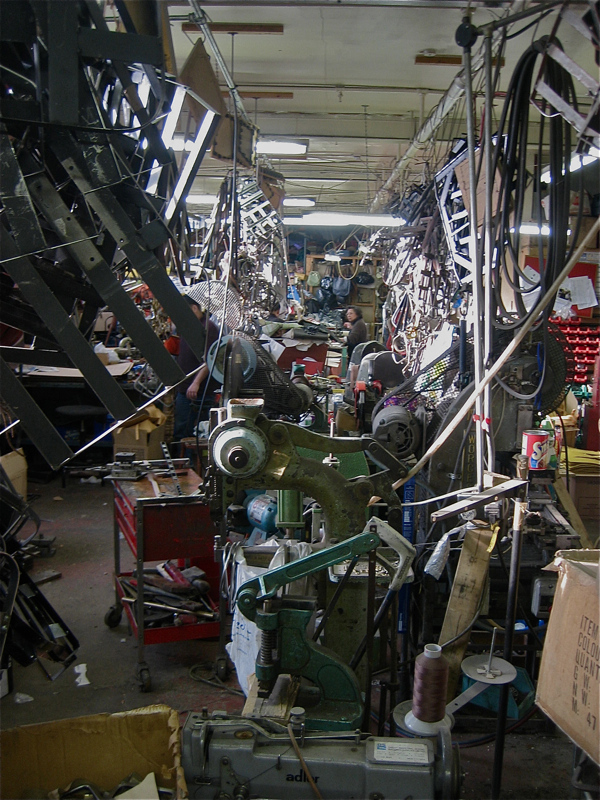 Here in one long room, lit by the streaming afternoon sunlight, a small number of skilled makers work amidst a breathtaking maze of old machines, workbenches and piles of leather. They sit beneath fluourescent tubes suspended at irregular angles, and amongst hundreds of metal patterns for cutting leather and all kinds of different handbag frames hung in clusters from the ceiling, as if deposited there by a steel spider. 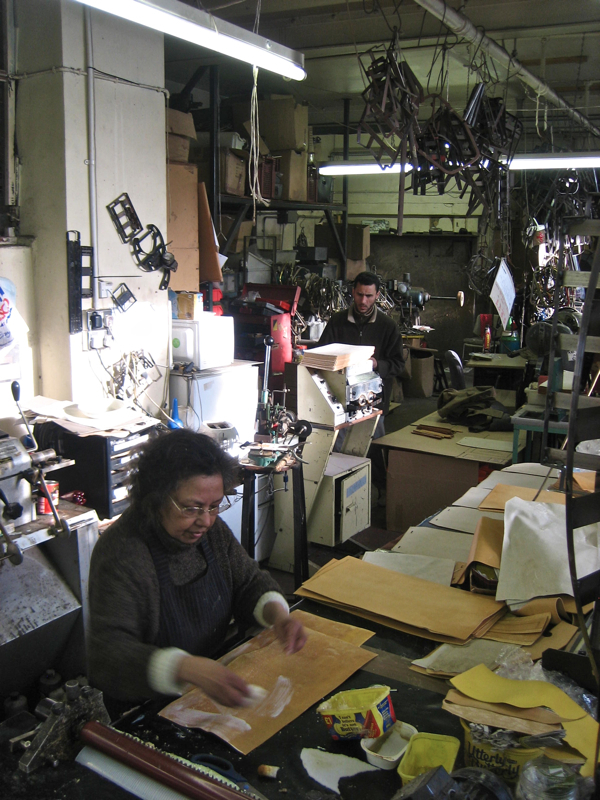 At the far end of the room, sits a collection of old frame-making machines upon which all manner of clasps and frames for handbags can be custom-made. 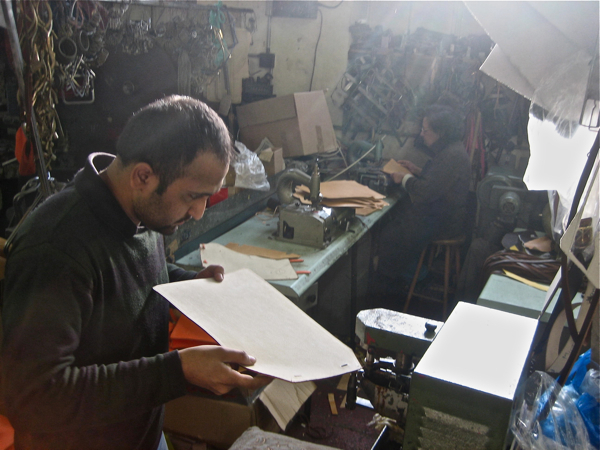 In the centre of the space, leather is being cut into the pieces of the pattern and laminated before the edges are sealed and polished. Finally, the pieces are sewn together at the near end of the room. 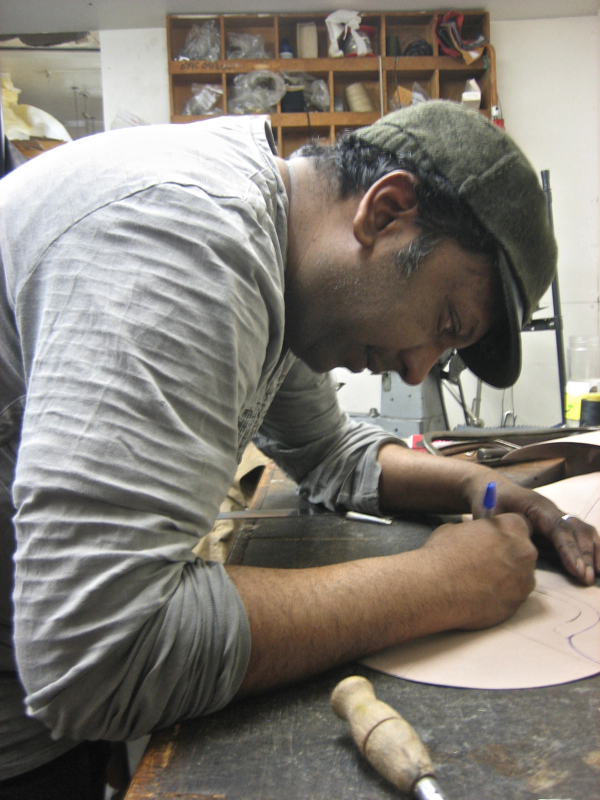 Bano’s father had been a tailor in Georgetown and Alfred’s father had been an engineer, so while Alfred went to work in engineering each day, Bano did piecework for bag companies in their basement in Stoke Newington, making handles and pockets. When Alfred was made redundant, they started their own bag factory together and rented the flat above to live with their children, eventually buying the house next door and expanding into it too, before moving to the current factory in 1978. At first, they found that shops would not deal with them directly as immigrants, so they employed English representatives to speak with the retailers. 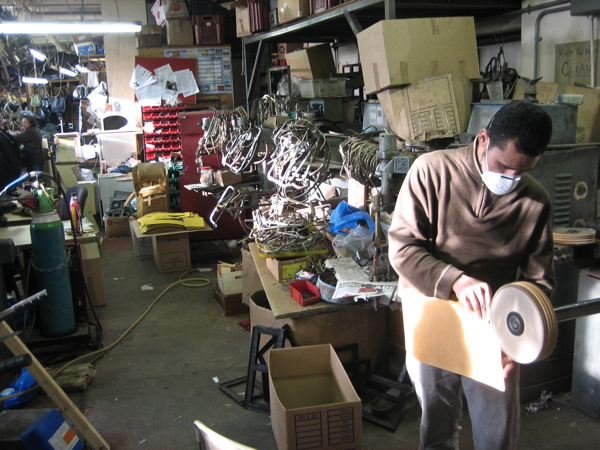 Junior stays here through the night working on these machines, committed to keeping the knowledge and culture of a lost industry alive, and through a working collaboration with Ally Capellino he has found a way to give it a future too. 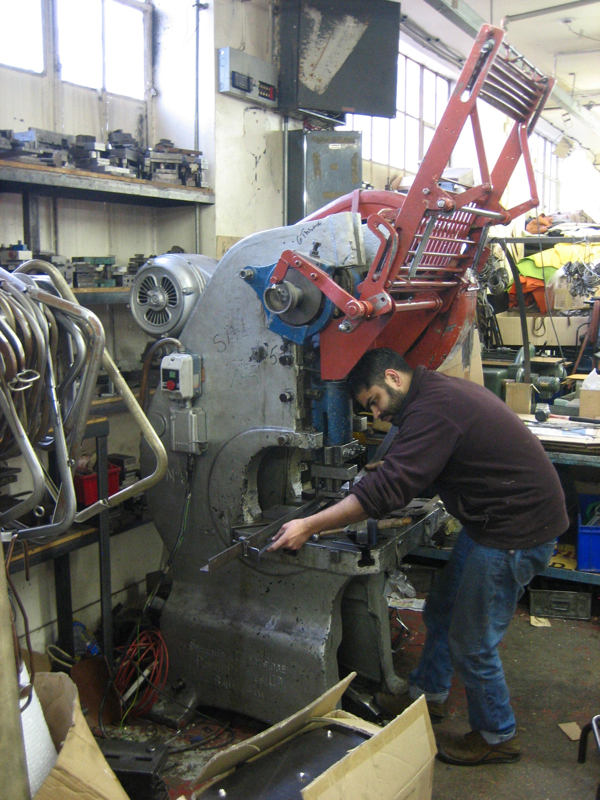 You can watch a film of an Ally Capellino design being manufactured at J&R Designs here. Faisal, the framing plant manager. Junior designs a template for a sample bag. 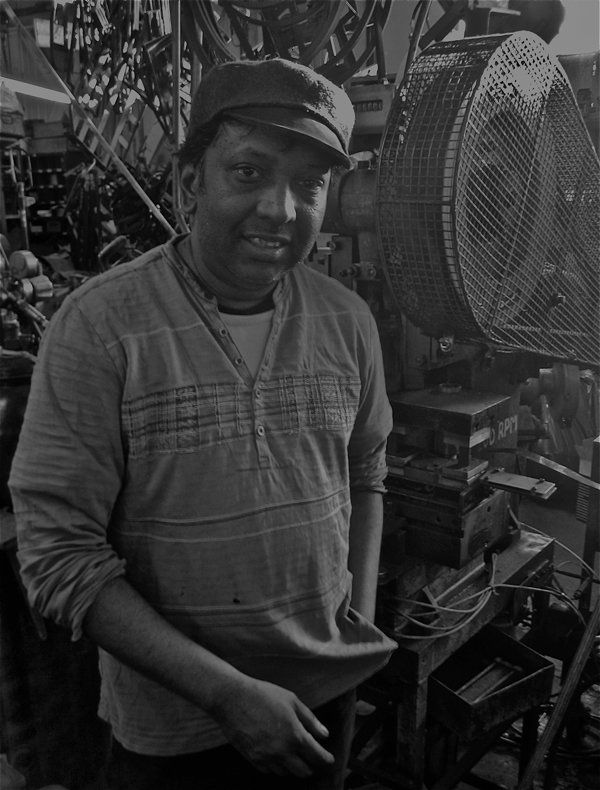 Persaud Junior with his Inverted Cropper machine that he and his father built in 1982. 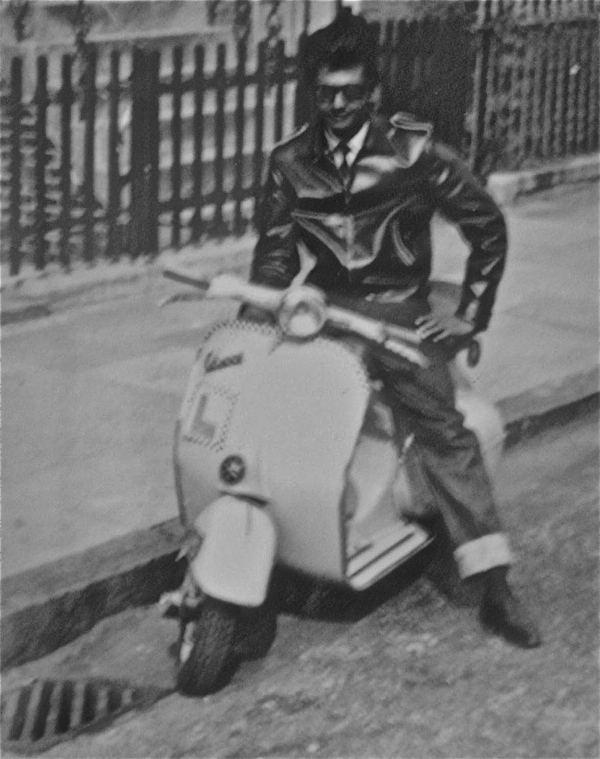 Persaud Senior with his Vespa in 1958. What a great place! I think that there will eventually be a big turn-around back to local manufacturing, based with small companies like this one. 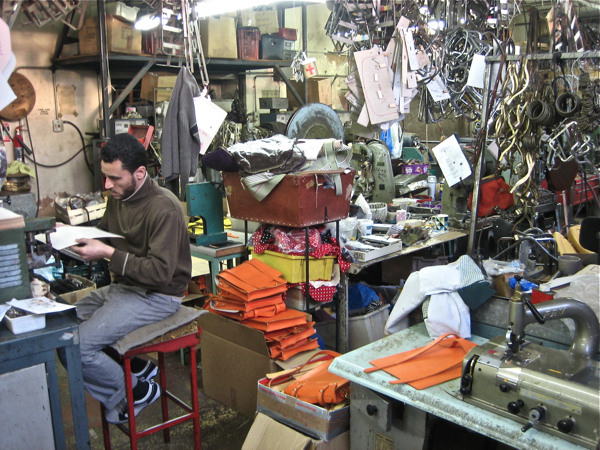 Obviously, I am a big fan of Ally Capellino’s bags anyway, so it’s nice to see where they are made. . . And, ok, I have a personal interest in the support of small businesses! - whats not to like? What My Father achieved… many would have given up on…but he secured our (his childrens) future.. and held his belief.. we merely continued his legacy.. I have a question. Can you make a leather bag for a child. : size 26cm wide, 18cm high. I prefer soft leather. Not too expensive leather, but good leather. What other colors do you have ? I prefer soft pink or light blue. At first, I would like to have a sample. Later I would like to place an order. What will the price be, for example ? What a nice factory from the Persaud family. You give me inspiration. I am starting my own handbag label. Is it possible to make 4 handbags for me ? When I get you reaction I will give you more details. I just bought a beautiful red leather clutch handbag in Toronto Canada. It was in store that sells goods at a discount from stores going out of business or distress sales of various kinds so I don’t know how it arrived here. When I looked inside, it says Made in England by PERSAUD of London. I didn’t know the company but know good quality (I think!) and was very pleased to find this site when I looked up the company. I am delighted to see where the purse was made, and by whom. I enjoyed a few more of your stories of Spitalfields too. Hi, i am interested in designing my own handbags/clutch bags and i am looking for factory to make me sample if possibile? I really like your story and wonder if you could help me and also how much in average it would cost? Just fantastic that this tradition carries on and has survived and flourished . There should be many more places like this. Great engineering skills Alfred.Just like his dad. Customising and refurbishing old machines and equipment to make them going as new.Always going to a higher level.R I P my brother.HATS OFF TO ‘PERSAUDS HANDBAG’.Keep up the good work.Let the flag of the Persauds raise to a higher level. Hi Herman, Alfred and Lind, I’m interested in designing my own handbags/clutch bags and I am looking for factory to make me samples if possibile? I really like your story and wonder if you could help me and also how much in average it would cost? I am possibly interested in having some shoulder bags made out of fabric would like to know roughly what you would charge. Hi I am looking to design a range of clutch bags, could you possibly help with this? if so, could i come and see you. I am looking for manufacturer and would like to have contact details please. What a fantastic story from the Persaud family. You are an inspiration!!! I am thinking of starting my own handbag label and looking for a manufacter and was wondering if someone could please contact me / i could come and see you. I would also like to know the costs of making some samples and then take it from there. I will like to make some bag sample s and small runs after ward. Please forward me your contact details. Do you have an email address that I could contact you on about a manufacturing query? Great to find a manufacturer that is still based in London. Do you manufacture with organic leather? I’m about to create a collection of leather shopping bags and am curious about your charge fees and turnover time. Glad to hear that you’re on the market for Leather. This is Sunny from Ningbo Bridge Synthetic Leather Co.,Ltd, specializing in manufacturing all kinds of synthetic Leather for bags in China. Lovely work. I have been searching for a quality leather bag manufacturing house in the UK for some time. I started a leather bag line last year and had to outsource manufacturing post failing to find a local partner here in the UK. If the Persaud Family is still in business, please contact me via the email address above. Would be interested in developing a range of tweed and leather bags….. please contact me.. I am looking for a quality leather bag manufacturer in the UK as I would like to have an antique bag rebuild from scratch. Could you please let me know how to get in touch. Many thanks! That was an amazing story, keep the flag flying, please get in touch. I’m keen to discuss about manufacturing and samples. The uniqueness of the bag, is , that it has interior gussets at the sides, is closed with a zip, which comes from each side, so it is possible to see right in to the bag, when it is opened. Would you be able to help? 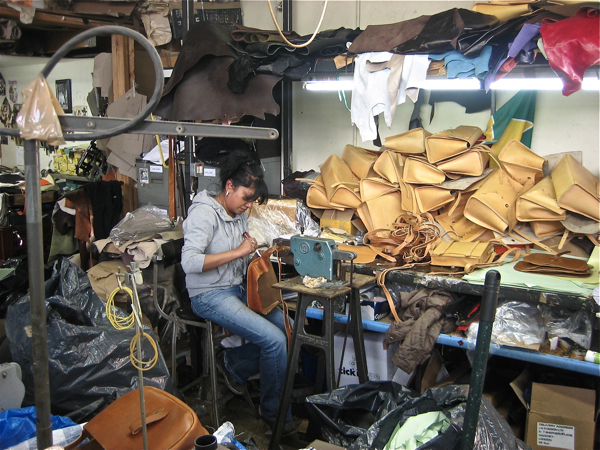 J & R are the foremost bag makers in the UK, apart from maybe Mulberry. They make some beautiful bags for London’s leading fashion houses. The pictures give a slightly ramshackle appearance to the factory but actually it runs pretty efficently. Mum , Junior and Lynda are just the nicest people and I am proud they are on my customer list. 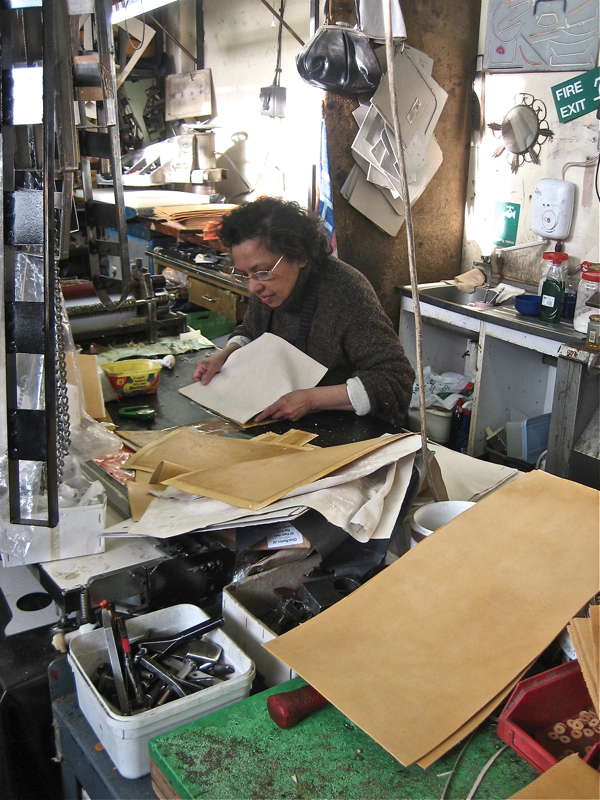 All the leather you see in the photographs came from Conceria Tempesti, Italy’s leading tanner of handbag leathers. Great story to here of a local London based business. I am very keen to discuss the possibility of ordering some quality leather bags. Please can you contact me on the email address provided. Look forward to hearing from you soon. I am looking for a manufacturer to produce leather handbags for me. Can you get in touch please? I am on a look out for a manufacturing firm just like this. Small runs and personal. Can I please get contact details to forward my work over? And plan a visit. Thank you. Could you tell me how much it would cost to produce a sample from drawigns? I’d provide materials. I’m working for a small london based designer looking to get some samples made. Your factory looks fabulous! – what a privilege to see. Can you help? Can I come to your factory to see what you do and to discuss this further? Such a fabulous story and so glad to see local quality production still thriving. I too, like many people on here, am looking for small runs of leather handbags for a website and a new store that has opened. Could you please contact me on the email provided as I am very keen to see what you can offer. This is such a wonderful story and good to know that true craftsmanship still exists in Britain. I am interested in starting up my own bag line is there a chance you can email so I can come down please. What a great story, i lived it. 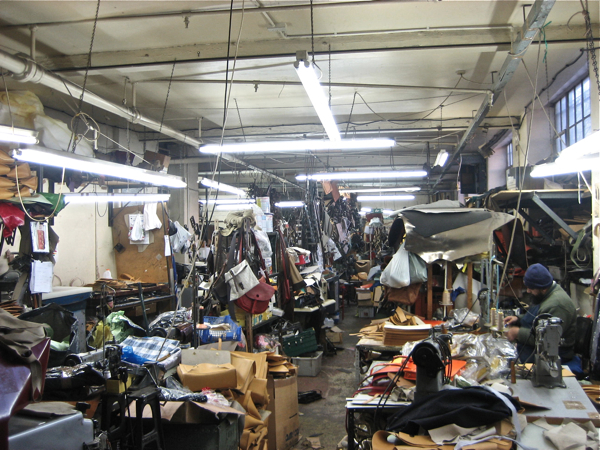 I can still smell the leathers and glue and remember the many years i spent working at the Factory with my sister and brother-in -law and later whenever i visit London my time is spent at the Factory with my niece and nephew. Hello, like others I am looking for a bag manufacturer. If the Persaud family still make bags, please send me an email. Wondering if the persuads business is still trading and how to get in contact with them in regards to producing a range of bags. Amazing people! 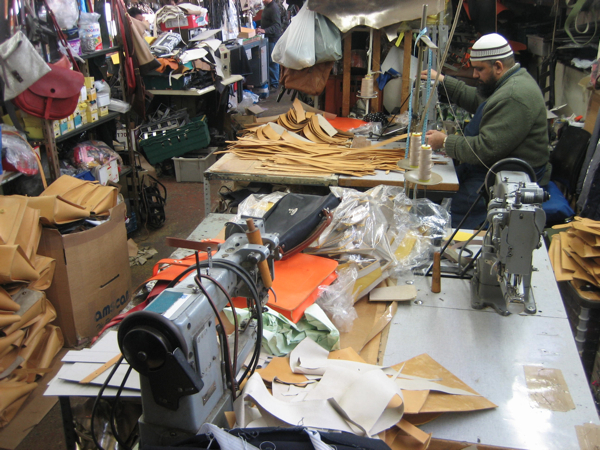 But usually extremely busy making bags for the larger, already established brands. As mentioned in the article. We’re pleased to introduce ourselves as a reliable manufacturer of leather gloves with well-equipped manufacturing unit which is running under larger production capacity. We admire you as a leading buyer of these products and thus we take the precedence to approach your benign trade house for the supply of our quality products for the benefit of both houses. To have an overview of our products we’ll send you the counter samples with the competitive prices for your kind considerations.